J.P. Crawford hasn't seen much playing time since rejoining the team from triple A.
J.P. Crawford opened the season as an everyday player but seems to be finishing it as an everyday bench player. 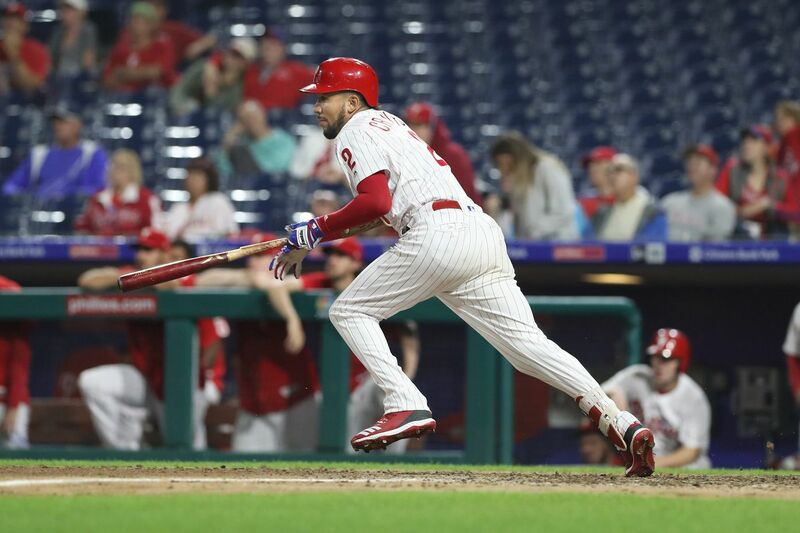 Crawford, who was the Phillies' regular shortstop at the start of the season, did not start either of Tuesday's games against Washington and has not started any of the seven games since returning from triple A. He drove a pinch-hit double off the right-field wall in the first game of the doubleheader, but that was not enough for him to start in the second. He has registered just two at-bats since returning from the minors, where he stayed after rehabbing his broken left hand. Crawford, who turns 24 this offseason, seems to be in the team's long-term plans. But manager Gabe Kapler said he has trouble finding time for him in the season's final month with Maikel Franco, Asdrubal Cabrera, Cesar Hernandez, and Scott Kingery also on the roster. The Phillies' offense has gone punchless during their tailspin. Perhaps Crawford, who started to produce at triple A before he was promoted, could provide a spark. "I'm thinking about it every day. I'm looking for opportunities to use J.P. Crawford. He's so talented," Kapler said Monday. "I think we'll be depending on him so much in the future that we want to get him looks. On the other side, we have some infielders who have performed very well for us. … It's not as easy as we want to get J.P. a look and let's just put him in the lineup. It's more, does he give us our best chance to win tonight? If not, how can we deploy him off the bench?" Kapler seemed to try anything he could to find a spark, as he used 23 players in a lackluster 3-1 loss in the first game of the doubleheader. Justin Bour started at first base and stayed in the game for two at-bats against right-handed starter Erick Fedde before Carlos Santana moved over from third base so the Nationals couldn't employ a left-handed reliever against Bour. Kapler used four pitchers to complete the fifth inning, bringing out three relievers who each faced one batter. He lifted Nick Pivetta after 4 1/3 innings and was aggressive with his bolstered bullpen. The Phillies used seven pitchers to record 27 outs and 15 batters to tally one run. Pedro Florimon played in the field to give the Phillies 23 players. "We're always like, should we have more bodies in the bullpen, should we have more bodies in the clubhouse, and the answer is almost always yes, because it gives you courage to be ultra-aggressive and try to win every moment of the game," Kapler said. Hector Neris has quietly recorded a strikeout in 17 straight appearances since June 17, becoming just the second Phillies reliever in the last 30 years to accomplish that feat, joining Ryan Madson in 2010. He has struck out 53.3 percent of the batters he has faced since returning from the minors on Aug. 14. … Aaron Nola will face Stephen Strasburg on Wednesday in the series finale.